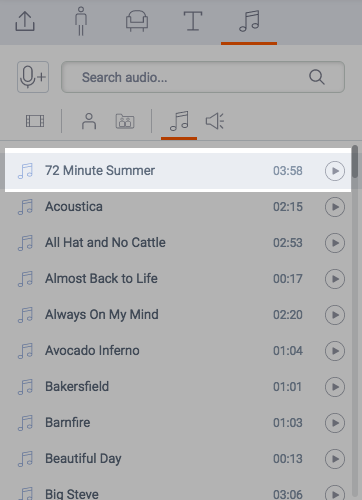 If audio tracks are 2-channel (stereo) or greater than 44,100Hz, re-exporting the file via Audacity, an audio editing software, may lead to a better upload and usage experience in Vyond. Additionally, exporting with a slightly different LAME code may also fix any audio upload issues. 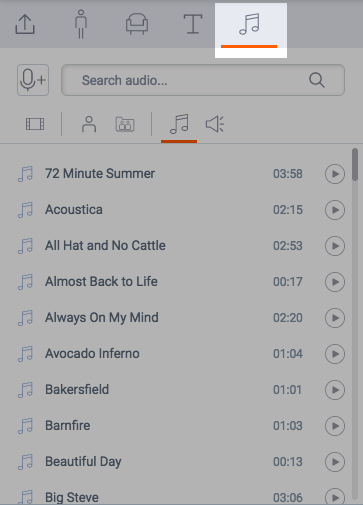 1) Click the Audio icon in the Asset Library. 2) Select a track. Preview the track before adding it to your video by clicking the Play button next to the track. 3) The audio clip is added to the Timeline at the bottom of the video maker.